Last week I played X-Wing for the first time! It feels like a lighter version of Tail Feathers. We played a team game and somehow our epic space battle took a little longer than usual according to those who play it more regularly. The dice were never really in favor of the attacking party, but they were helping out the defending party a lot. 😉 I’m curious how (quickly) the game plays one-on-one. Have you ever purged your board game collection? And if you do, what makes you decide to ‘get rid of’ a game? I still have a number of games that are on the “to go” list. They usually get on that list when I question myself: “Would I still like to play this game?” If the answer is “No, because I would prefer playing that other game from my collection”, it has to go. For example, since I have Puerto Rico and my girlfriend has Agricola, I got rid of most of my other worker placement games because I will always prefer playing one of those two games. Yes we does it sometimes. Our decision i based on how many times the game comes to the table. I purge about twice a year, and look for games that I realistically know will never hit the table again. I give them as “prizes” at our community game nights, where they usually start as the seeds of other family’s collections. It keeps our family-friendly game nights thriving. I really like the idea to give them away as prizes on game days! Thanks! I’ve only ever really gotten rid of a single game that I had. the Lord of the Rings living card game. It was fun, but super frustrating. I took a loss on it but it went to a good home. This is always tough. I mean, I’m certain I have games that don’t reach the table (Shogun, Alien Frontiers, TI3 [Forget TI4, I’ve fought so hard to get the expansions and not one month afterwards, they announce TI4. ], and just themed games. The other problem is having too many copies of any given game [my main group currently has 3 copies of Scythe, 3 of Champions of Midgard, and I think there are other games where we have multiples], but that only hurts you if you solely play with a single group. I’m slowly trying to extend out to play with a new local group so this might work out. All in all, culling is hard because you recall why you got the game just you get heart broke you never got to truly enjoy it as intended. I’ll get rid of a board game when you can pry it out of my cold dead hands! I’m a terrible hoarder, especially when it comes to board games. The only game I’ve considered getting rid of is Agricola, since we never play it after having bought Caverna, but I still can’t bring myself to. There are even some classic games that I still want to get, even though I know I’ll probably not play them too often, just to have them in my collection. I understand the feeling completely. I am happy to trade or sell away games that I don’t like anymore or don’t play anymore, but there are always a few that I keep for nostalgia’s sake alone. For example, Ticket to Ride is the game that got me back into the hobby after more than 10 years, and also the first game that my wife and I played regularly, but now we’ve played it soooo many times and have probably only played it once or twice in the last year or two. Legitimately, it’s probably time for it to go to make room for other games, but it means to much to let go. I’m afraid that a lot/most of our games are in Dutch. The boardgame assosiasion neer you is always happy to take games (if there not in current collection. Games will be addid to the availeble to the collection that can be played by annyone, caus the collection is open to tge general public at least for the hosted events. 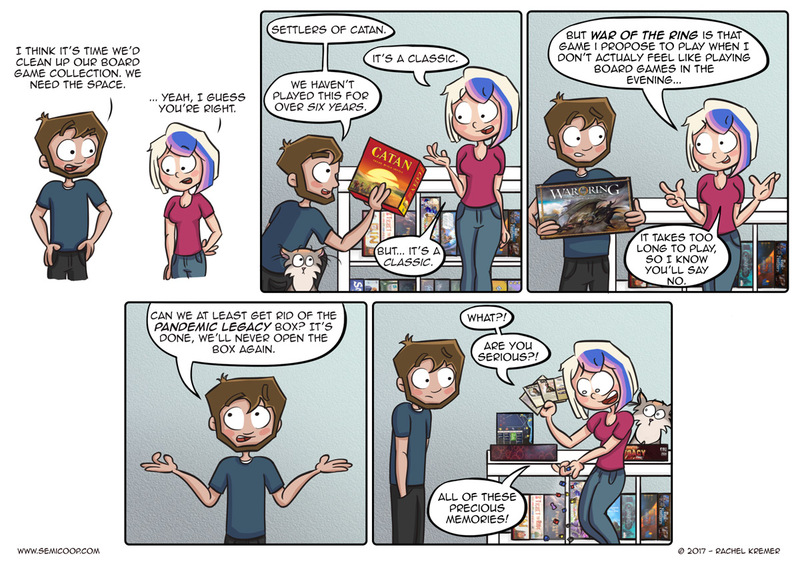 For me its shelf space and the question:will i play it again. I recently did this via auction where I put up 25 games for sale on BGG. When I was taking inventory of the components, my wife asked, “you’re getting rid of these, why?” I replied, “point to one game in the stack you’ve played.” She couldn’t. “That’s why” I said. • items (including games) that may become useful at a future time need to pass the following test to be kept: are they valuable? Are they irreplaceable? Are they memorable? If they don’t pass at least one of those tests, they have to go. This is why I can give up a copy of a game that, if I want to play in the future, should be easily obtained. However, if I have some emotional attachment (other than the price paid – that money is lost, get over it), or it is a rare printing, or it could be useful for some other hobbie (e.g. Keeping zombicide to practice painting minis) then I’ll keep it. • I find enjoyment out of getting repeated plays at excellent games and trying to figure out new ways to win. 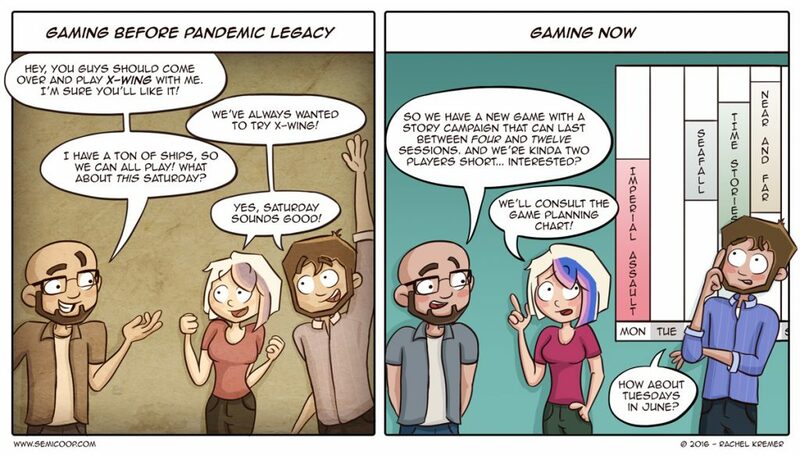 This, versus succumbing to the “cult of the new” and trying to own every new game that comes out. • I have a group of friends that I game with, and odds are one of them will own the game. If not, odds are one of the game stores I frequent will have a copy. And if all those odds are against me, there’s always auctions and math trades to try to get a used copy. Last resort, buying it. But I’m trying to be more resourceful instead of procuring everything. • scarcity breeds creativity. Having less to choose from makes me thankful for what I do have. It’s hard to appreciate your belongings if they’re crammed into every nook and cranny. Those are my reasons/thoughts. Good luck with your purge! Getting rid of a game before getting a new one feels a little bit too drastic to me – although it does really make you rethink your collection in a good way and probably prevents a lot of impulse purchases. I really like the solution of putting games in a ‘danger zone’, so to speak. Thanks! Reiner Knizia – designer of over 600 published games – when asked which of his games is his favorite, likened them to his children. You cannot have a favorite child, can you? I could come back to desiring tiny box games again to find my past self had hastily decided he didn’t need them any longer! Plus, considering how fleeting the availability of titles can be, I especially fear getting rid of something, regretting it, and not being able to get it back. Each year we have on our 10×10 challenge, 1-2 games that we will trade away. I’ve sold/traded away a few games already. Problem is that in our small country ppl prefer to trade than to buy old games. So I get rid of some game, just to get a new one.. space problem is not solved at all.